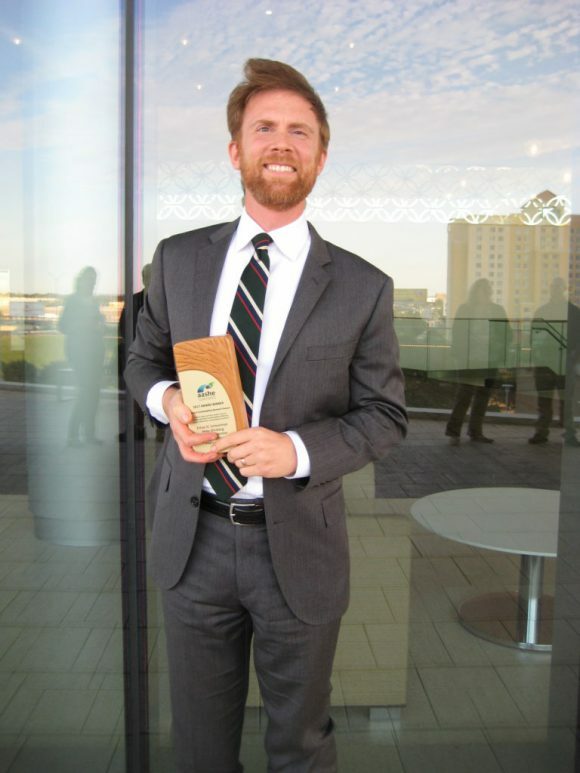 Share the post "Assistant Professor Ethan Schoolman Receives 2017 Sustainability Award from Higher Education Association"
Ethan Schoolman, assistant professor in the Department of Human Ecology. The Association for the Advancement of Sustainability in Higher Education (AASHE) announced Ethan Schoolman, currently in the Department of Human Ecology, as the recipient of the Campus Sustainability Research Award for outstanding achievements and progress toward sustainability. AASHE bestows its prestigious awards on the institutions and individuals that are helping to lead higher education to a sustainable future. Schoolman was part of a team that included Mike Schriberg, then education director at the Graham Sustainability Institute at the University of Michigan (UM), and Sarah Schwimmer and Marie Tysman, then undergraduates at UM. The paper they co-authored, titled “Green cities and ivory towers: how do higher education sustainability initiatives shape millennials’ consumption practices?”, was part of the Sustainability Culture Indicators Program (SCIP) at UM where Schoolman did his Ph.D. and had a postdoctoral fellowship. One of the major goals of SCIP was to study the knowledge, attitudes and behaviors of students, faculty and staff at UM as they related to sustainability, in the areas of transportation and travel, conservation and waste prevention, food, climate change, opinions about sustainability in general, and awareness and evaluation of sustainability at UM. Millennials currently enrolled at a major public university, while broadly supportive of public transportation, recycling, and conserving energy and water, are much less interested in incorporating environmental concerns into decisions about food and in actively reducing their consumption of material things. Despite the sizable investments of UM in sustainability initiatives and environmental programs, there is little evidence that undergraduate students are becoming more committed to sustainability as a result of their time on campus. In fact, student willingness to recycle and conserve natural resources may be highly dependent on the institutional conveniences of campus life, and it was not clear that students would continue such practices once these conveniences had disappeared. Schoolman and his team argued that universities like UM and Rutgers, while often making big investments in sustainable facilities and sustainability education, need to do much more. In particular they believe that students would benefit from opportunities to learn about and encounter sustainable food and alternative food systems inside and outside the classroom. Universities must also find ways to encourage adopting environmentally responsible behaviors outside the “campus bubble” and into the real world and life after school. To read more about AASHE’s awards programs, please visit the website.